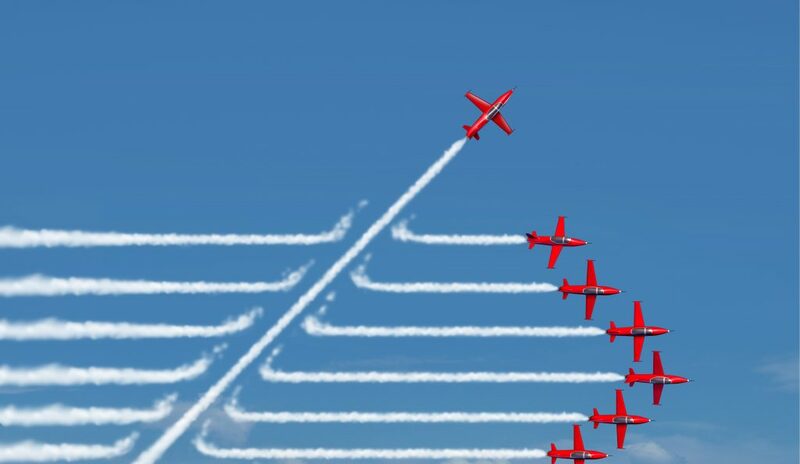 Game changer business or political change concept and disruptive innovation symbol and be an independent thinker with new industry ideas as an individual jet breaking through a group of airplane smoke as a metaphor for defiant leadership. …until they did. You might be familiar with Warren Buffet’s announcement earlier this month that he is selling a third of his stock in big blue, and that he doesn’t value the stock “the same way” anymore. But the famous industry proverb at the top of this article dates back to the 1970s, and isn’t really about IBM at all. It’s about supporting the status quo, and at times it was used to defend not financially backing Microsoft, Apple, Google, Amazon & a host of other services and platforms that now enjoy the lion’s share of the tech world that used to be the sole provenance of IBM. Without question, this line of thinking extends beyond the tech industry. From retail to education to food service, adhering to the status quo has been the safest way to do business at the individual level. If you’re worried about your boss firing you, there’s no easier road to take then doing what everyone else is doing. But what if you are the boss? What if it’s your money on the line? Your automotive dealership, for example. You could go with the generic, the same vendor many of your competitors use. Sure, you’ve heard some things about their customer service, and it looks at a glance like all their websites are identical so you’d have a hard time standing out. But they’re the one of the most common providers. They have to be doing something right, no? Blockbuster. Tower Records. Polaroid. Circuit City. Borders. Titans who dominated their respective industries. Today you can read about their storied legacies in the Wikipedia. What changed? Everything. Everything but them. Maybe it’s time to stop following the herd and see what the true visionaries in your industry are doing. Maybe it’s time to focus on your customer and break a few rules. Maybe it’s time to give us a call and see what a customer centric website can do for your dealership, for your sales, for your service, for your customer loyalty and brand perception. Oh, and to bring our conversation full circle: When asked earlier this month why his legendary insight didn’t lead him to invest in Google or Amazon shares, Warren Buffet had a one word answer: “Stupidity.” Wise comment from the greatest investor of all time.